An initiative to do just that failed at the ballot box, but gave us all some welcome inspiration. Not all that many generations ago, the idea of an income floor for working Americans—a minimum wage—seemed impractically utopian. Today we have mandated state and national minimum wages, and the vast majority of Americans want these minimums kept at meaningful levels, as voters made clear most recently in New Jersey. But what about the notion of a “maximum wage,” a ceiling on the income any one individual can grab from the marketplace? Could a wage maximum ever become as central to our sense of social decency as a wage minimum? The results from the November 24 Swiss referendum on a proposal to cap CEO pay—at twelve times the wage of a company’s lowest-paid worker—don’t at first glance seem to bode well for that prospect. The Swiss pay cap failed, by a 65-35 percent margin. 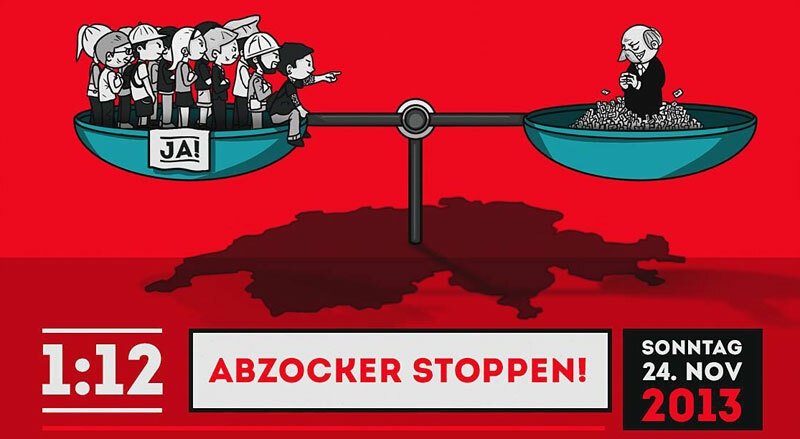 Activists in the youth wing of Switzerland’s Social Democratic Party had spent four years working on behalf of the “1:12 Initiative for Fair Pay.” They had collected the 100,000 signatures needed to get on the ballot and enlisted the support of Swiss labor unions and the country’s two largest left-of-center political parties. The young 1:12 activists ran a delightfully creative campaign. No corporate executives, they argued, should be able to make more in a month than workers can make in a year. The 1:12 vote, despite all this noble effort, still fell disappointedly short. Do Swiss voters simply not care that top executives at world-famous Swiss brands like Nestlé and Swatch are making well over 100 times more than their workers? Hardly. They care plenty. The 1:12 initiative was running dead even in the polls into October—until Swiss corporations unleashed a lushly financed fear-mongering ad blitz. If the 1:12 initiative passed, they argued, Swiss-based multinationals would shift their operations to friendlier locales, Switzerland’s tax receipts would plummet and the nation’s social safety net would tear into tatters. Swiss corporate leaders, interestingly, made little attempt to advance the arguments that American apologists for excessive CEO pay so routinely trot out: that high executive compensation acts as an incentive for high executive performance, and that no modern corporation can compete globally without rewarding execs at “competitive” levels. But the debate over the 1:12 proposal exposed the emptiness of the corporate rationales for executive pay excess. Back in the 1980s, backers of the initiative pointed out, Swiss businesses competed quite effectively without lavishly compensated executives. In those years, the Swiss think tank Denknetz notes, Swiss CEOs averaged only six times Swiss worker pay. And at least one major Swiss company is still compensating—and succeeding—at that pay ratio level. Victorinox, the 129-year-old company that makes those iconic red Swiss army knives, pays its top execs no more than a half-dozen times what workers make. Few Swiss companies today follow the Victorinox lead. Since the 1980s, Switzerland’s CEO-worker pay ratio has soared, with top execs at major firms like drugmaker Roche pocketing over 250 times the compensation of their lowest-paid workers. This sort of excess simply appalls most Swiss, and they made their displeasure known last March when they passed — with a 68 percent “yes” vote—a referendum that bans CEO signing bonuses and “golden parachutes” and gives shareholders at Swiss companies the right to veto overstuffed executive pay packages. The success of that measure last spring may have actually worked against the 1:12 initiative. Many Swiss apparently decided to give the March initiative a chance to damp down CEO pay excess before voting for a mandated cap that might have corporate execs exiting Switzerland and taking their companies with them. Future 1:12-like campaigns will have to figure out how to respond more effectively to corporate exit threats. And future 1:12-like campaigns do seem likely. Activists in France, Spain and Germany are already talking about pay ratio campaigns. One poll has found that nearly three-quarters of Germans would support a 1:12 ratio, and German Chancellor Angela Merkel is reportedly considering some variant of executive pay limits. Here in the United States, of course, developments along these lines seem politically inconceivable. At the height of the Great Recession, we couldn’t even prevent million-dollar bonuses for CEOs at bailed-out financial giants. But the ground may be shifting on our side of the Atlantic as well. One sign of that shift: An unlikely trio of senators—Republican Charles Grassley of Iowa and Democrats Joe Manchin of West Virginia and Barbara Boxer of California—has introduced a defense authorization amendment to reduce the amount federal contractors can charge the government for executive compensation. The current annual maximum of $763,029 per executive would drop to $230,700, adjusted annually for inflation. This welcome initiative would, unfortunately, not curb the stock options and other “performance-based” awards that make up the bulk of executive pay packages. Lockheed’s CEO, for example, pocketed $23.8 million last year, $18.1 million of it in stock options that were no doubt inflated by profits from military contracts. The proposed Senate amendment limits only the pay for which a company can directly bill the government for reimbursement. To seriously leverage the power of the public purse against CEO pay excess, governments at every level would have to do much more. Organized nurses in Massachusetts have one suggestion. Like the 1:12 campaigners in Switzerland, they’ve gone the referendum route and collected 100,000 signatures—well over the 68,911 required—to place on the November 2014 state ballot an initiative that would levy fines against any hospital receiving taxpayer money that pays its CEO over 100 times what the hospital’s lowest-paid workers receive. In California, SEIU’s United Healthcare Workers West is working to get on the 2014 ballot a proposition that would limit pay for the state’s nonprofit hospital CEOs to no more than the salary of the president of the United States. President Obama took home $400,000 last year. California’s 10 highest-paid “not-for-profit” hospital chief executives averaged $2.6 million. These two campaigns only hint at the organizing that could link tax dollars to the struggle against executive pay excess. Activists could, for instance, press local, state and national authorities to deny procurement contracts to corporations that compensate executives more than twenty-five or fifty or 100 times what their workers are taking home. In the United States last year, AFL-CIO researchers calculate, big-time American CEOs collected 354 times more in compensation than average American workers. We actually may know soon which specific US companies have the widest CEO-worker pay gaps. The 2010 Dodd-Frank Act includes a provision that requires corporations to annually disclose the ratio between what they pay their CEOs and their median—most typical—employees. Corporate lobbyists have been stalling the enforcement of that mandate, but this past September the US Securities and Exchange Commission finally proposed regulations that would allow this Dodd-Frank section 953(b) mandate to go into effect. The SEC is currently collecting comment on the proposed disclosure regs, and the AFL-CIO, Public Citizen and other groups affiliated with Americans for Financial Reform have so far rallied more than 100,000 letters of support. This pay ratio disclosure, once in place, will give activists a golden opportunity to organize campaigns that might fine high-pay-gap companies, as the Massachusetts nurses propose, or deny them government contracts—or simply serve as a trigger for consumer boycotts. The Swiss pay cap campaign helps demonstrate that consumer boycott campaigns would find a substantial constituency, suggests British social scientist Richard Wilkinson, the co-author of the landmark 2009 book The Spirit Level: Why Greater Equality Makes Societies Stronger. Consumer movements against executive pay excess, Wilkinson told us recently, could surely thrive in this environment, as could campaigns to place significant worker and community representation on corporate boards and give tax advantages to enterprises—like employee-owned companies and co-ops—with narrow pay differentials. And if those roots do indeed grow deep, Switzerland’s young 1:12 activists will certainly deserve a bow. Read Allison Kilkenny’s report on Black Friday activism this holiday weekend.